Honored As the year comes to a close the Indoor Football League will look at the Top Ten Players of the 2015 season, culminating in the announcement of the Top IFL Player of 2015 on New Year's Eve. 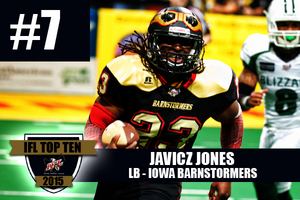 The IFL is proud to announce that Iowa Barnstormers LB Javicz Jones has been named number seven on the IFL’s list of the Top Ten Players of 2015. A dynamic defensive playmaker, Javicz Jones had an incredible season for the Barnstormers in 2015. In his first season in Iowa, Jones led the IFL in tackles with 122 and his 14.5 tackles for loss was tied for first in the league among all linebackers. Jones finished his season with 122 tackles, three sacks, 14.5 tackles for loss, one forced fumble, three fumble recoveries, two interceptions, three pass breakups and two blocked kicks. For his efforts he was named First Team All-IFL Linebacker. The multi-talented Jones showed his range as a player as he was named IFL Week 7 Special Teams Player of the Week and Week 15 IFL Defensive Player of the Week. He was the only defensive player in the IFL to be named to both honors. Jones will look to follow up on his spectacular 2015 season as has already re-signed with Iowa and will suit up for the Barnstormers in 2016.